After 3 hectic days of Navaratri, the fourth day was a day of rest and relaxation, which means that the minute Samhith left for school, I was overcome by a bout of laziness and decided to do none of my usual routine stuff, including the puja. I spent the day chatting with Usha probably wasting her day in the process……but then we all deserve a day off now and then, don’t you think???? The evening brought with it a bout of rain and thundershowers accompanied by lightning, which seemed to put a dampener on my visit to the temple. Left to me, I would have succumbed to my laziness and bid goodbye to the temple visit, but then I had to reckon with Samhith and Shankar (who had unexpectedly returned home early from office). Samhith just wouldn’t hear of not visiting the temple, and with his dad backing him, I had to just pull on my plastic sandals and unearth my umbrella and head out in the pouring rain for the temple. So now you know whom to thank for today’s pics of the temple decoration. 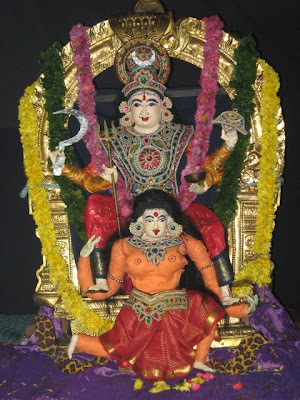 The theme at the temple was Attukkal Bhagavathy – a form of the Devi at a temple in Kerala. We have visited this temple before and you can read myblog about the temple here. You can also see the following websites for more information about the Devi. The temple visit seemed to have cured my laziness for I got down to work and even found the enthusiasm to draw the kolam last thing at night, ready for today. I usually love drawing the kolam, especially like the one here, but this time things have been so hectic that I haven’t been able to put a big one since navaratri began. We live in a building where there isn’t much space for kolams and usually put big ones at night so that it dries before people leave in the morning, so that they can step on it without slipping…… so here’s today’s. Yes, yes, I totally agree about taking a nice break once in a while! And yay! I finally appear on your blog! 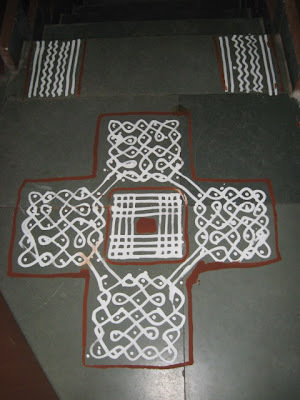 Btw, I love that kolam, next time you are making one, will u remember to pls call me to watch the process?